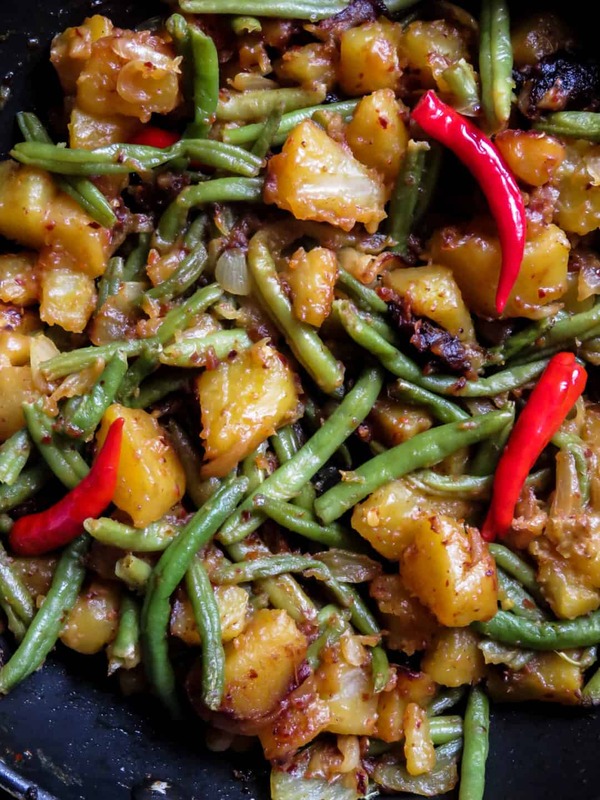 If you love the combination of potatoes and green beans, chillies that add extra punch then you just might love this colorful, skillet dish. 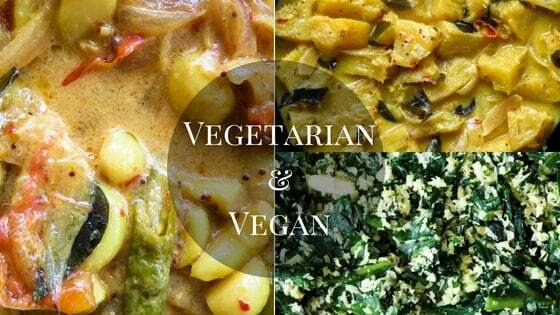 I admit after dhal curry, this probably is my favorite combination, they are a part of my weekly menu. Because of this reason, I like to try as many variations as possible. 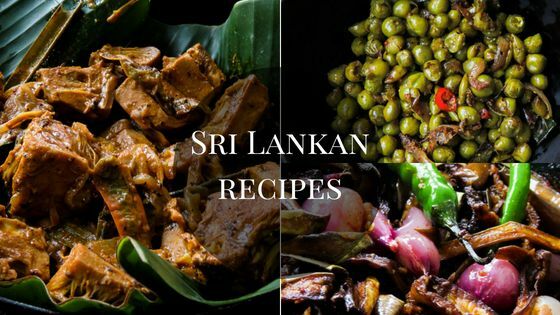 I have already posted a milder version for you to try, a creamy, Sri Lankan coconut milk based potato and bean curry. It’s perfect for anyone who dislikes anything spicy. For you, spicy lovers out there, well this is for you. 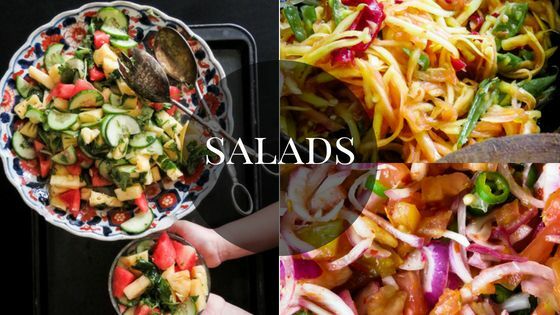 It’s time to create your own dish. 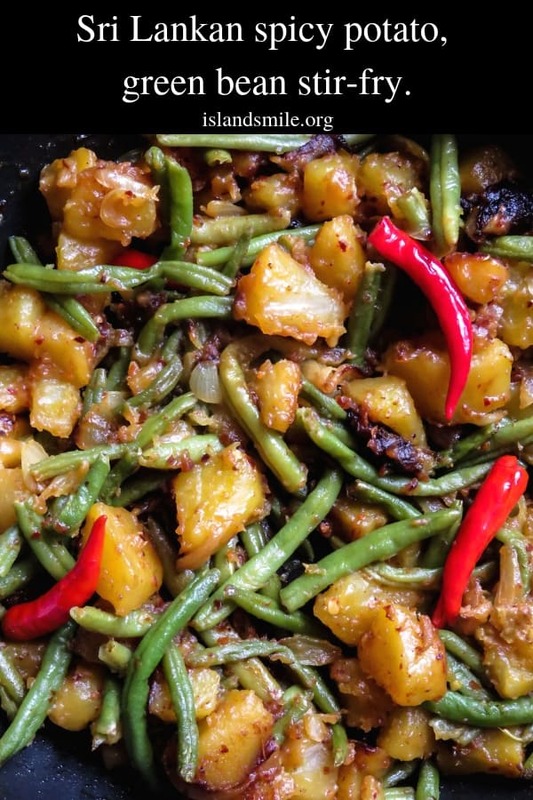 Here are a few variations you can try using this spicy potato and green bean skillet as a base. How do you cook your green beans and potatoes? Do you have a particular way you like to cook them? If you do, Please do let me know. 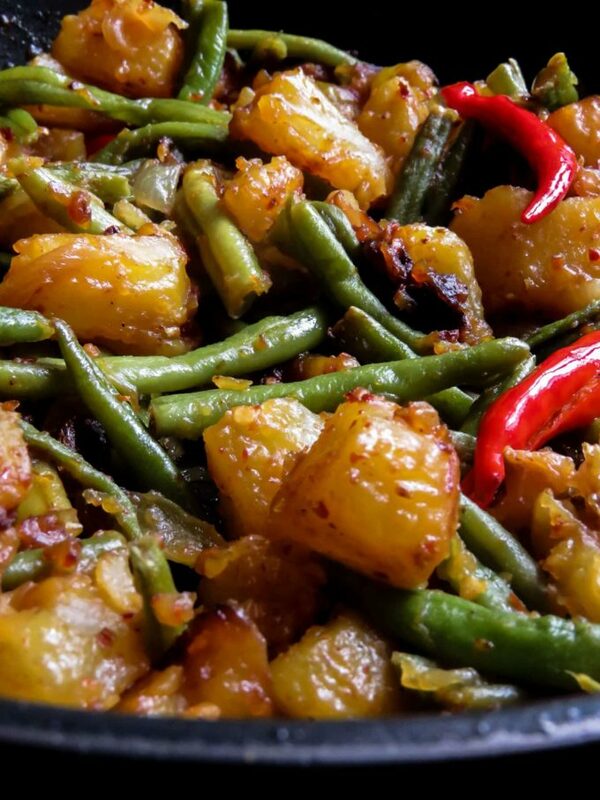 1/ Leftover rice can be put into use by mixing into this potato and green bean stir-fry, creating an easy vegetarian pilau. 2/ Leftover grilled or rotisserie chicken can be added to this skillet and turned into a single or two person skillet dinner in a rush. 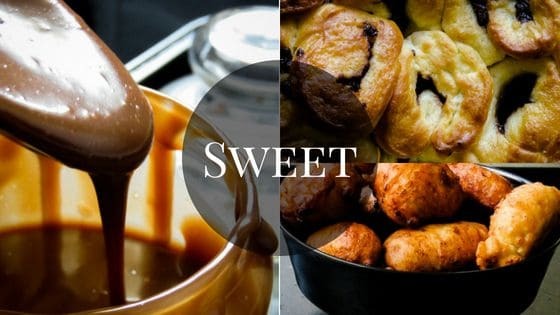 3/ drizzle your favorite sweet and spicy sauce and create a sweet and savory dish, you can even add your favorite meat into it. Instead of cutting the potatoes wedges, discs or strips, cut them into cubes so that they fry evenly. Yes, you can make this vegetarian stir-fry using frozen green beans. You need a chopping board, a knife, a bowl to collect the vegetable peelings and a frying-pan, preferably a non-stick one. You will be cooking onions and potatoes until they turn brown, during this process, the onions and some bits of the potatoes might stick to the pan. These dark, caramelized bits add flavor to the stir-fry so you will want to gently scrape them with a wooden spoon and mix in with the beans and potatoes. Using a non-stick pan makes this part of the cooking process easy. Wash, Clean, peel and cut the potatoes into cubes. set aside. Wash the green beans, trim the ends and cut them into half. set aside. Place the frying pan over medium heat and pour in the oil, let the oil heat for a few seconds. Add the curry leaves, onions, garlic and sauté the ingredients for a few minutes or until the onions turn translucent. 3-5 minutes. Add in the potatoes and then the turmeric powder to the tempering ingredients and sauté until the potatoes turn a light golden brown. 5 minutes. Pour in 1/4 cup water, cook until the water completely evaporates. the reason I’m cooking the potatoes in such a small amount of water is to make sure that the potatoes are cooked through. Once the water evaporates, add in the chilli flecks, green/ red chillies and continue to sauté. 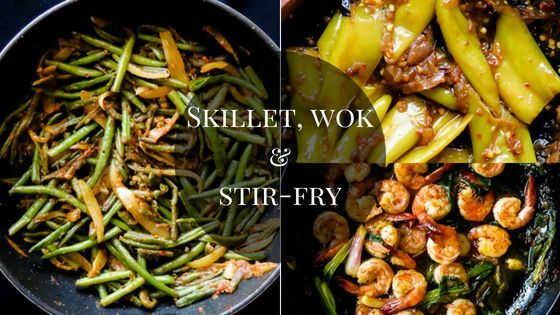 Season with salt and add in the green beans to the stir-fry. add a tablespoon of oil if you feel it’s necessary while you continue to cook. While sautéing, you might find the browned bits of potatoes sticking to the skillet, gently scrape it off the pan and continue cooking as these bits of really browned potato and onions add flavor to the dish. Once the beans are cooked through, Check for seasoning, add salt if necessary and serve warm. 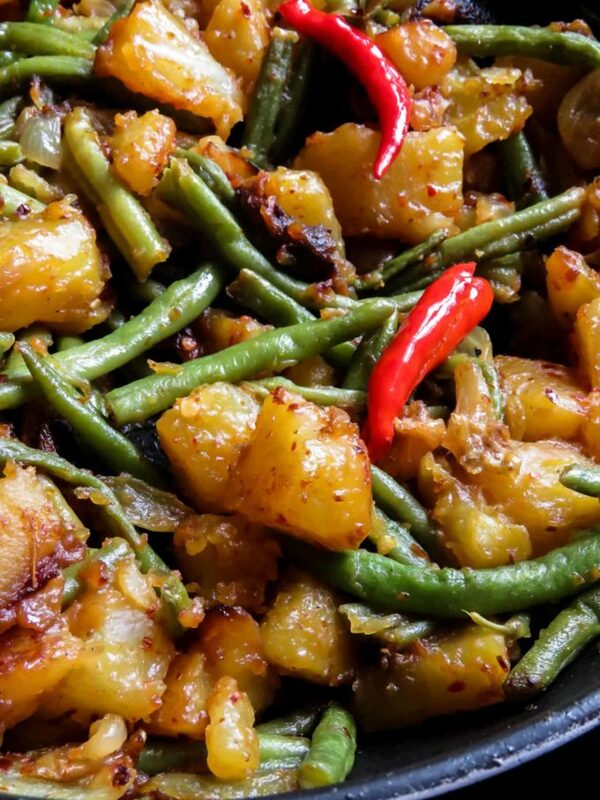 SRI LANKAN SPICY POTATO, GREEN BEAN STIR-FRY- VEGAN, VEGETARIAN SIDE-DISH YOU CAN PREPARE TO ACCOMPANY ANY MEAL. Love your recipes keep coming and thanks a bunch.